If you are having a hard time getting ahead, you are not alone. The middle class is under attack and the enemy is not some boogey man hiding in your closet, this enemy is inflation. While the economist say that inflation is tracking somewhere around 2%-5% depending on which economist you are following. The reality is the rate of inflation is much higher than that. Milton Friedman, Nobel Prize winner was sounding the alarm in the 1970s when the U.S government went off the gold standard. Prior to Richard Nixon taking the United States off the gold standard every dollar in circulation had one dollar of gold to back it up. Since gold was used as money for over five thousand years and always held its value even to this very day. How Does Inflation Hurt the Average Person? One of the best ways to understand inflation is by going to the supermarket and looking at the prices of food. Have you ever noticed that the price of things continues to rise without fail? While a small portion of this increase is due to higher wages the primary reason the costs go up is our currency is losing its purchasing power. The majority of us understand the concept that the less of something we have the more precious it is, that is true with fiat currency which is what we are using now. The Federal Reserve (nongovernment body) is printing large amounts of money, they call it deficit spending but what it means to the average person is spending more money than what you can afford. Since the paper currency has nothing of value to bac it up the government can print it. History has shown us that all fiat currencies fail and the U.S Dollar is poised to fall to unless the government makes some changes to the way it creates money. The only way to protect yourself from inflation is to put your resources into real money and real assets. Experience has demonstrated that gold is the best way to hedge your money against inflation. When there is uncertainty in the market investors try to buy all of the gold they can get their hands on which drives up the price. An ounce of gold today can buy just as much as an ounce of gold did at the turn of the 20th century. 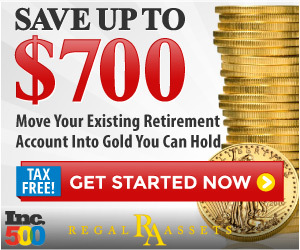 In order to maximize these savings an individual will need to purchase physical gold and also set up a gold based IRA. This will reduce the total amount of taxes an individual has to pay. Do not for a moment think things are going to get better on their own, things are going to get worse as the Fed continues printing money. Protect yourself and your family by investing in real assets like gold, you will be happy you took action.